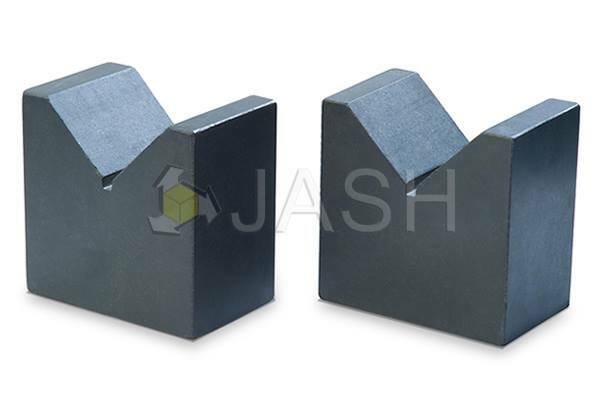 JASH V-Blocks are widely used in Workshops , Tool Rooms & Standard Rooms for variety of application in Tooling and Inspection purposes such as marking accurate Centers, checking concentricity, parallelism etc. The V-Blocks are typically used to hold round metal rods or pipes for performing drilling or milling operations. Screw clamps are also available and are provided upon request. Thus, the V-Blocks can be used for workholding as well as for inspection. Apart from the standard V-Block configuration, we also offer custom V-Blocks and Magnetic V-blocks. The magnetic blocks have internal magnets and are useful for securely holding work pieces for inspection and light cutting operations. They can also be used for marking of round objects and measuring to different shapes. 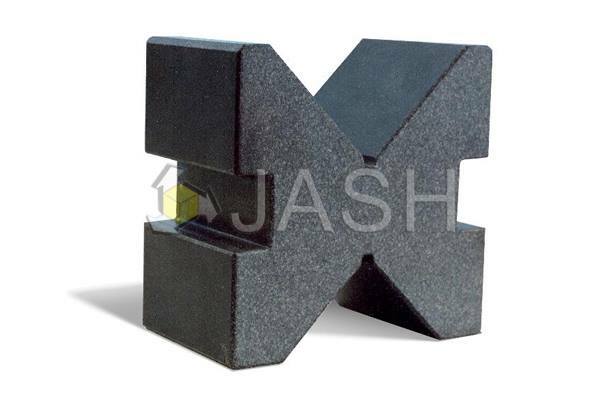 For all V-Block requirements, Consult with JASH, the leading manufacturer and supplier of V-Blocks and other precision tools. C.I. Universal V-Blocks, C. I. Plain V-Blocks and C. I. Elongated V-Blocks are made from close grained C.I. castings conforming to Grade FG-220 of IS-210, offered duly hand scraped finish. Universal and Elongated V-Blocks are generally conforming to IS-4960 and Plain V-Blocks are generally conforming to IS-2949. Steel V-Blocks are made from hardened and ground alloy steel having hardness 55 to 60 HRC, generally conforming to IS-2949 available in Grade-A accuracy having included angle 90 deg +/- 5'. Granite V-Blocks made from good quality Granite, working faces offered duly finely lapped finish having included angle 90 deg +/- 5'. Clamps offered for Plain V-Blocks (Cast Iron, Hardened & Ground and Granite V-Blocks) on request. Magnetic V-Blocks and other non-standard sizes on request.